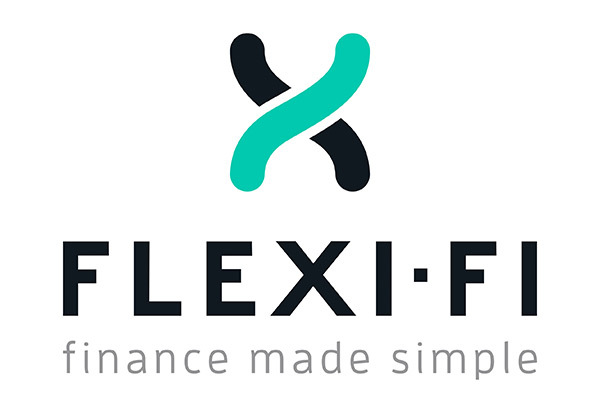 Ask our team about installation! Artificialgrass.ie has Ireland's top grass installers on the team, contact us on (01) 8018000 to get your grass and installation quote together. Alternatively you can install it yourself with the following guidelines. Work out lengths and widths to be covered as you will need them when ordering the grass. The roll(s) of grass are laid out. As the rolls have a directional pile, please ensure that all rolls are laid out in the same direction (if joins have to be made). The joining tape is to be laid green side down to the ground, white side up. Follow the instructions and safety information on the packaging of the adhesive product you are using. 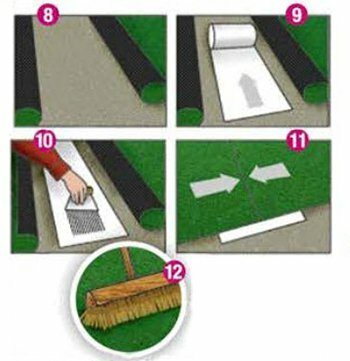 Please ensure when folding the grass back and pressing that the grass fibres do not get trapped in the joint. We recommend fixing the grass to the sub base using 5 – 6 inch stainless steel or zinc coated nails, driven into the sub base every 2 – inches around the per metre. Remove all surface imperfections and thoroughly clean and dispose of dirt, paint, grease or any residue which will prevent good adhesion for fixing the grass to the surface. For decking – attach the grass with screws so that the decking can be checked for damage or resealed after installation. 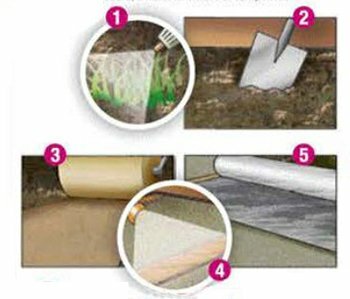 For concrete – attach the grass using glue or Hilti nails. For cobble locking – we suggest just using glue along trip hazards and using sand infill to weigh down the grass to make sure the cobbles are left undamaged.